Therminol LT is a synthetic aromatic heat transfer fluid. It can be used in both liquid-phase and vapor-phase, and has excellent heat transfer and fluid properties for low-temperature applications. Low Viscosity—Low viscosity at exceptionally low temperatures makes Therminol LT is excellent for pumping extreme cooling applications. Excellent Low Temperature Performance—Therminol LT has the best low temperature heat transfer coefficient of all coolant fluids. Therminol LT has excellent heat transfer properties to -75°C (-100°F). Vapor Phase Operation—Therminol LT can be used in the liquid phase between -75°C (-100°F) and 315°C (600°F). 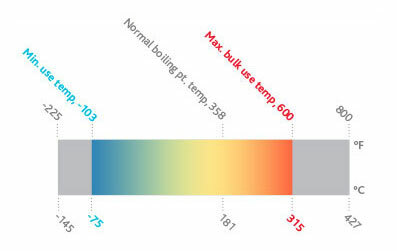 With a boiling point of 181°C (358°F) at ambient pressure, Therminol LT can be used in the vapor-phase above 181°C (358°F).